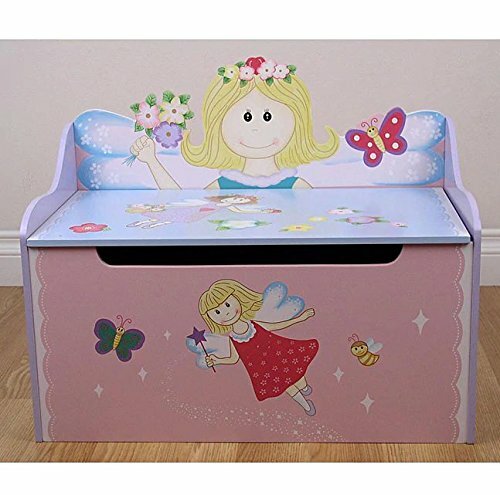 This flower fairy storage toy box bench is the perfect piece of furnishing for your child's room or play area. Cut-outs in the lid or seat top prevent finger pinching and the solid wood construction ensures it can withstand even the toughest of play times. This toy box is hand-painted and the top lid is fully removable so your little one can store all of their toys. If you have any questions about this product by Kids Warehouse, contact us by completing and submitting the form below. If you are looking for a specif part number, please include it with your message. Cute Frog Stackable Storage Organizer by Clever Creations | Collapsible Storage Box for Any Room | Perfect Size Chest for Organizing Dog Toys, Clothes, Shoes and More! Zoo Storage Organizer by Clever Creations | Toy Box Folding Storage and Play Mat for Kids | Perfect Size Toy Chest for Organizing Books, Toys | Collapsible for Creative Play | 9.5 x 10.75 x 13.75"